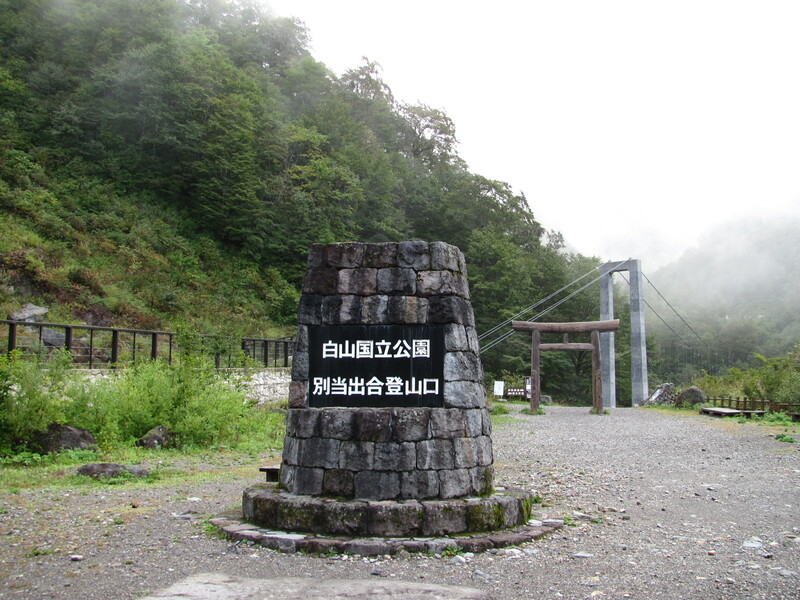 My recent post about Shirakawa-go reminded me that I hadn’t actually discussed the ways in which Hakusan, Ishikawa’s holy mountain, has tried to take me out. First, I feel like I need to stress that Mt. 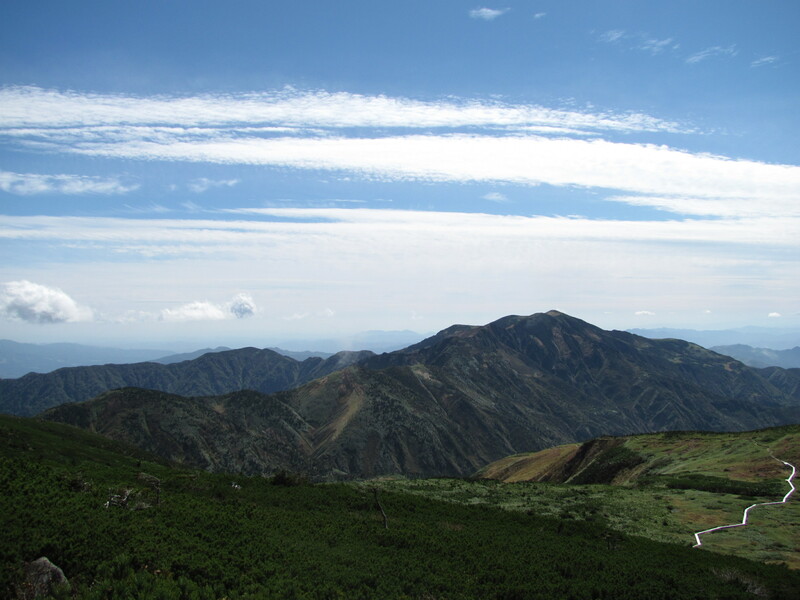 Hakusan (白山） is not a bad hike. It’s not an easy hike for a beginner, but even if you don’t have all the right hiking equipment, it’s not impossible. 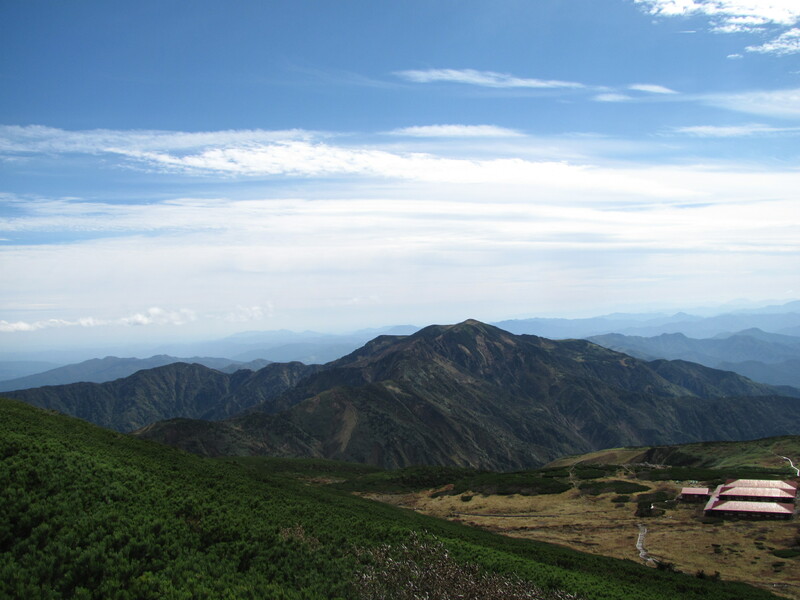 Japanese hikers will go all out with the hiking gear, and if you have the equipment or the money to buy some, there are plenty of athletic stores like Montbell in Kanazawa. The problem for me is that I’ve been unwilling to invest in nicer/proper gear because I just wasn’t sure how long I would stick around in Japan. More gear would be just one more thing to pawn off if I left, so I’ve done Hakusan twice with old cross-trainers and a hoodie, once sharing a hiking backpack and once with a small one-shouldered athletic backpack. No walking stick, no special socks, no fancy safari hat. It can be done, but you risk the local hikers looking at you like you will surely die on the mountain. Proper gear is good, but planning is critical. 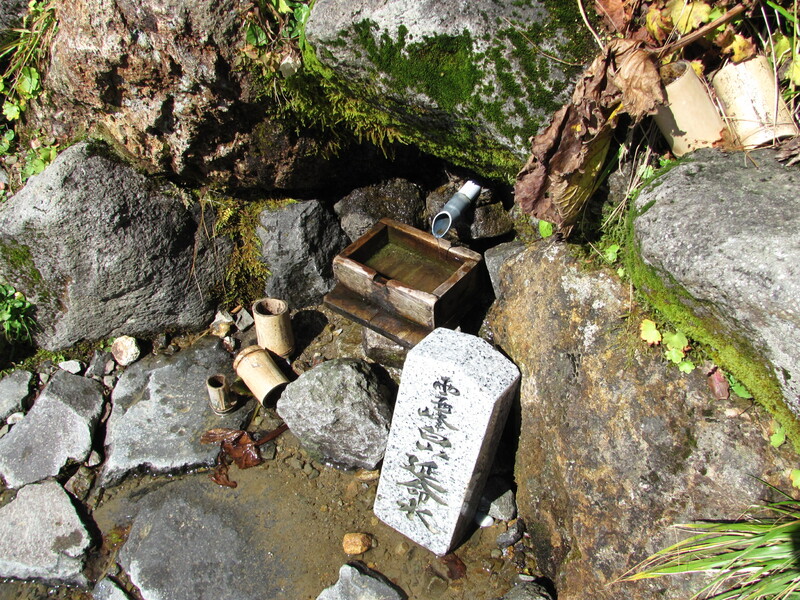 Hakusan is nice because there are several places with restrooms and water supplies. In my opinion, the best time of year to go is the first weekend of October, thereby avoiding the summer heat and need to carry even more water, as well as the holiday weekends during Silver Week (end of September) and Health-and-Sports Day (around October 10). Having a good map to get you to the base with the buses is good, too. We ran almost an hour late due to iPhone maps and to late-comers to the massive caravan. Be sure to check when the last bus is from the start of the hike to the base, too. No, seriously. Heading out of the woods and into a more open part of the trail. 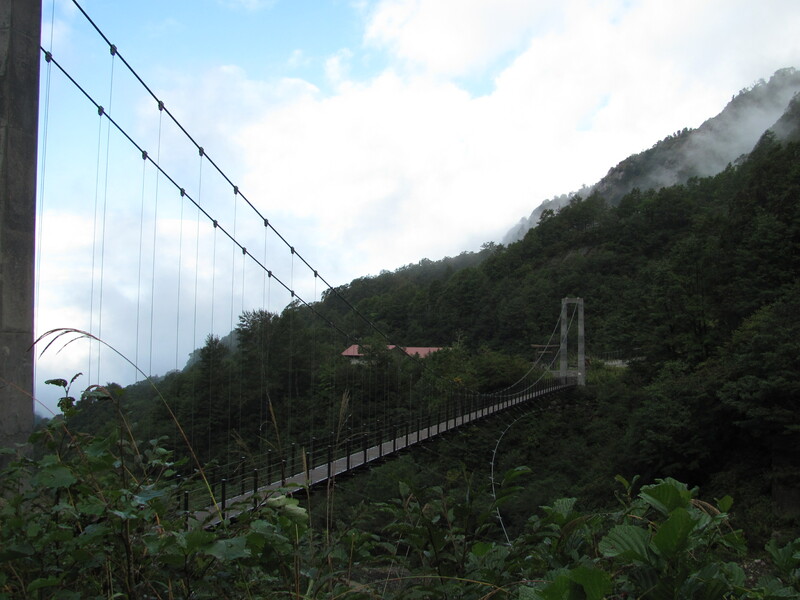 The hike, which takes at about 8 hours from the base (including buses) to the end, starts out in a wooded area after a suspension bridge. This area is fairly steep and rocky, but not overly exposed. 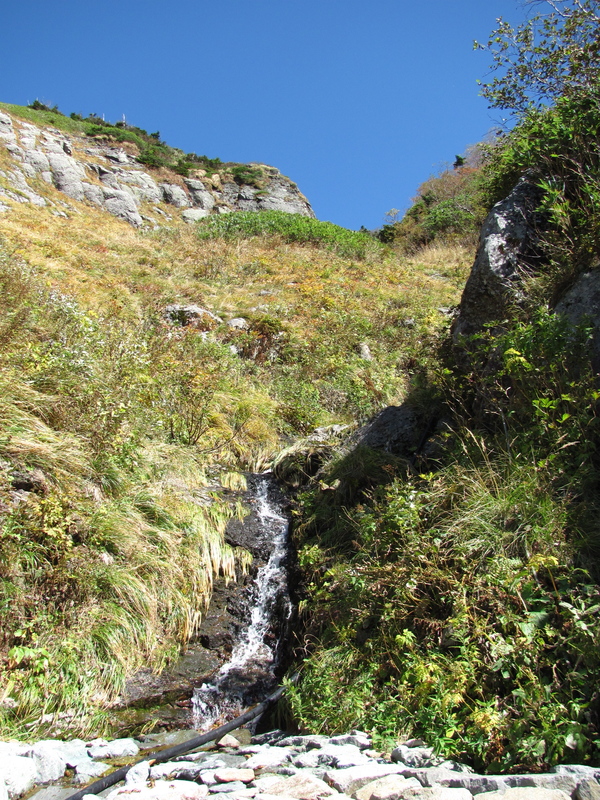 From here, you travel into a grassy and more open part of the trail, ascending higher and higher till you encounter a path winding through pine-like bushes. We left the base around 8 am, reaching Murodo around 1 pm due to some minor injuries. 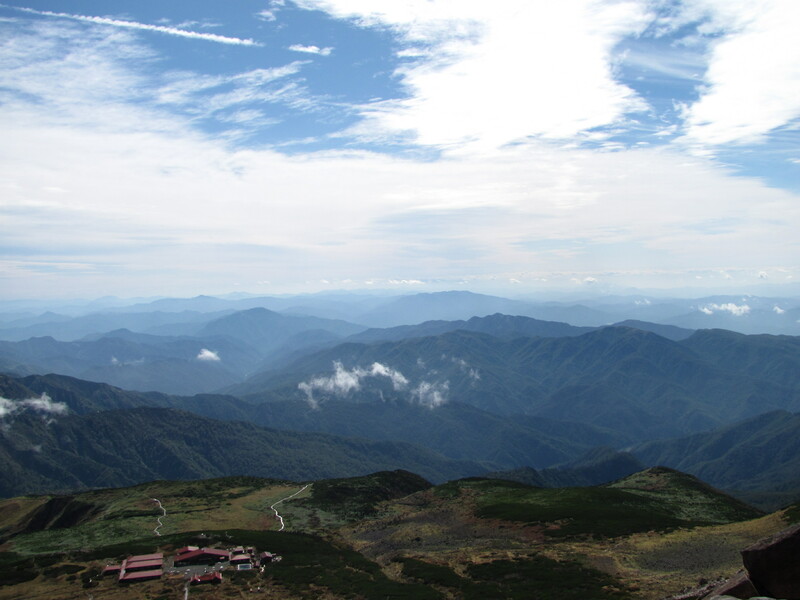 From Murodo, it’s about 30 minutes to the peak of Hakusan. 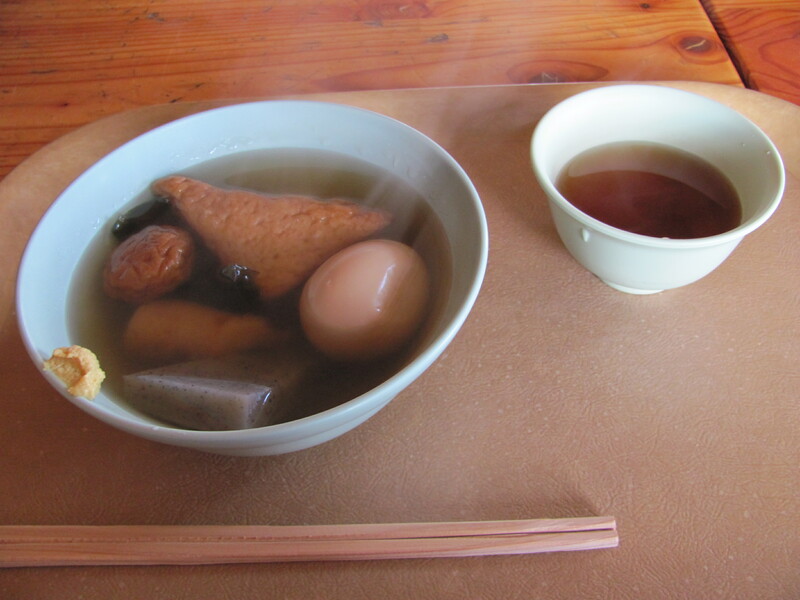 We stopped for lunch (curry rice or oden) at the hut before making the final ascent. The view from the top is amazing. In addition to the whole valley below, there are some gorgeous blue lakes in the craters on the mountain, a dormant (dead?) volcano. 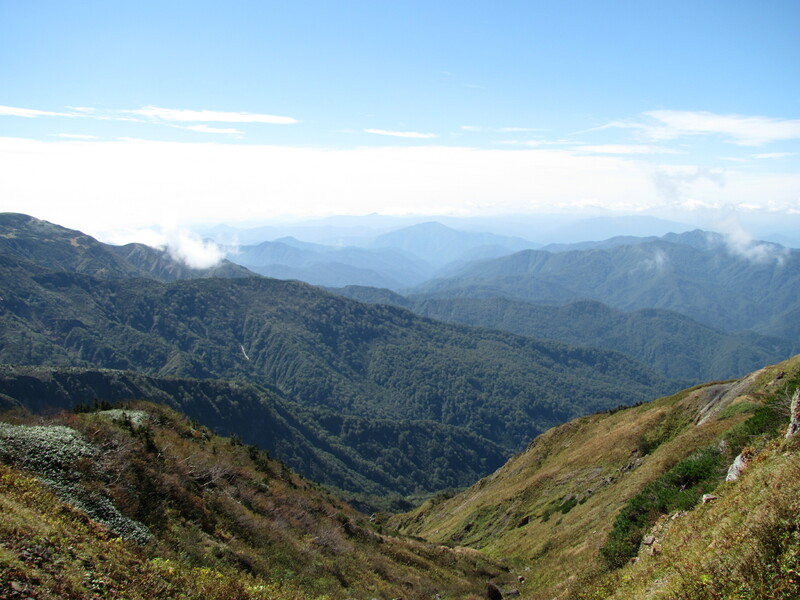 If you are spending the night at Murodo, you could go for a hike down to one, I imagine. 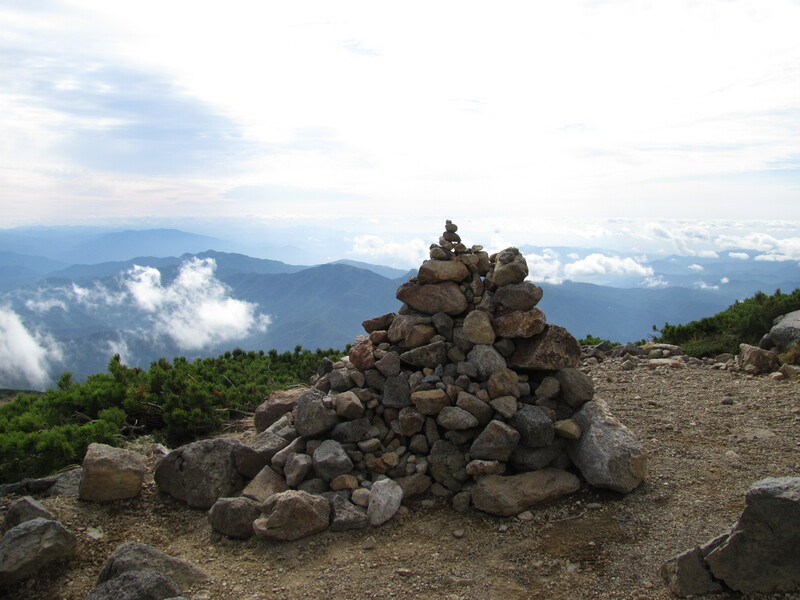 For one of the other hikers, getting to the peak of Hakusan was also personal challenge. In my case I had failed to get to the top in July 2010 because of time constraints (trying to get to the hut down the other side of the mountain before dinner). One of my friends had had to call in the emergency services when the person she hiked with messed up his knee. 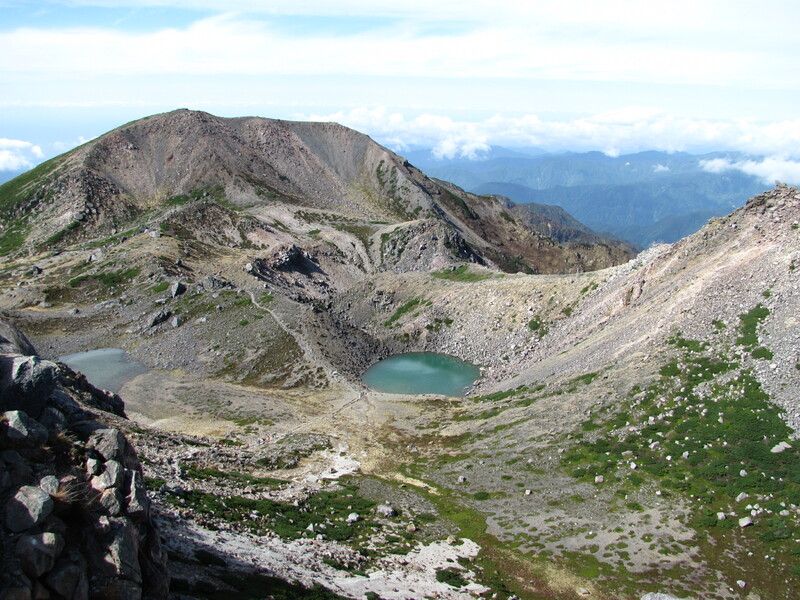 (With all the rocks and the steep incline on much of the trail, Hakusan is brutal on the knees and groin muscles.) 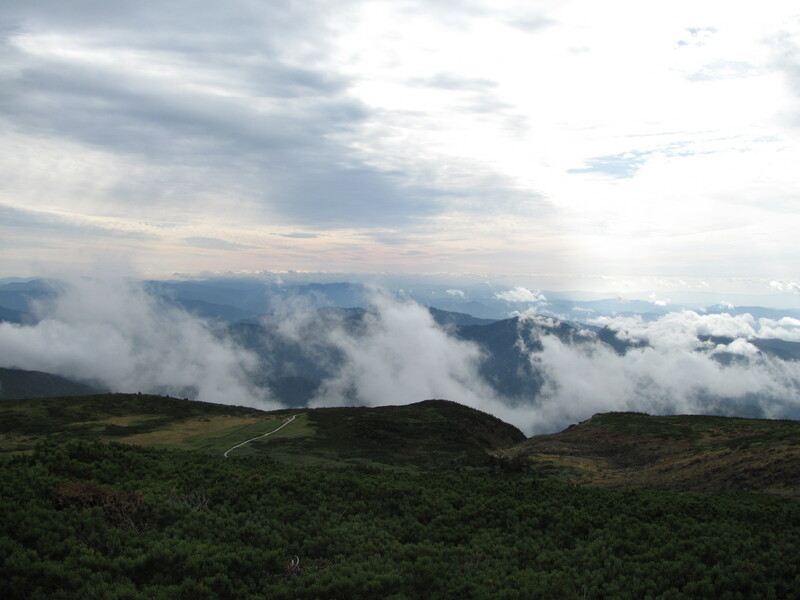 For the other two members of our group, going to the peak of Hakusan was a challenge to accomplish–their first time at the top of a mountain in Japan. Unfortunately, being the kings of the world didn’t last long, as we had to make it off the mountain before sundown. 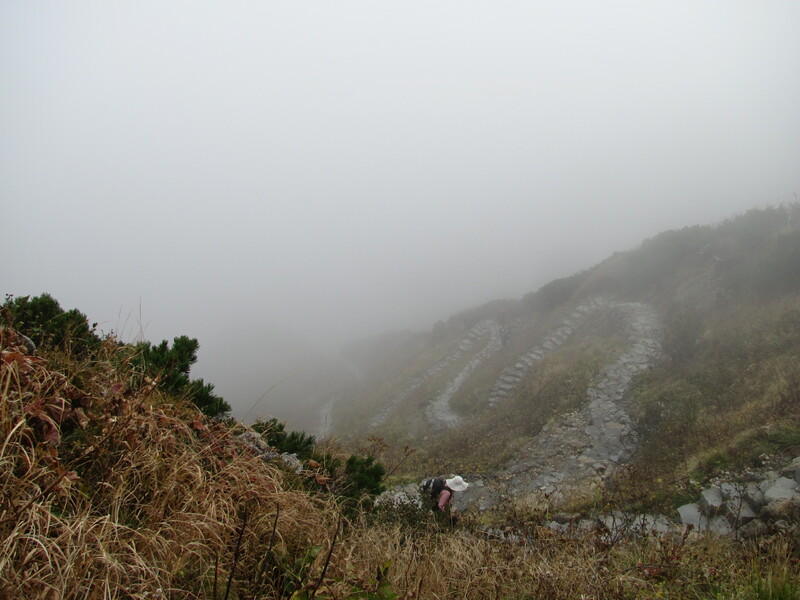 What happens in the mountains around Ishikawa is when afternoon rolls around, clouds and fog move in on the mountains. Visibility was awful, the path was slick, and we were running on pure adrenaline the last hour as the sun set. 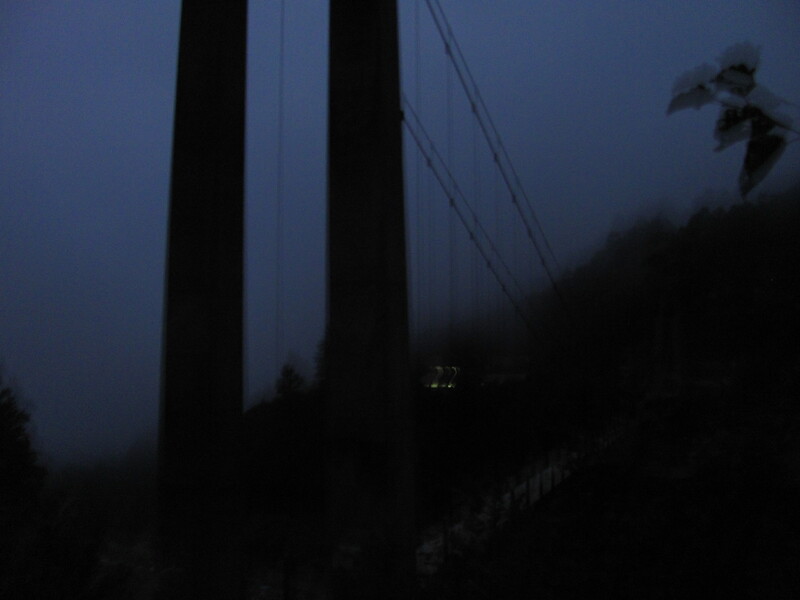 Our party lagged far behind the others because of a variety of minor injuries–pulled muscles, mostly–but we crossed the final bridge at 6 pm on the nose, in the dark and 2 hours after the last bus. Miraculously, a friend who had sprained her ankle walked down the path to the parking lot and drove back to get us just when we were trying to figure who would go down the last couple miles on the road to get to a car. 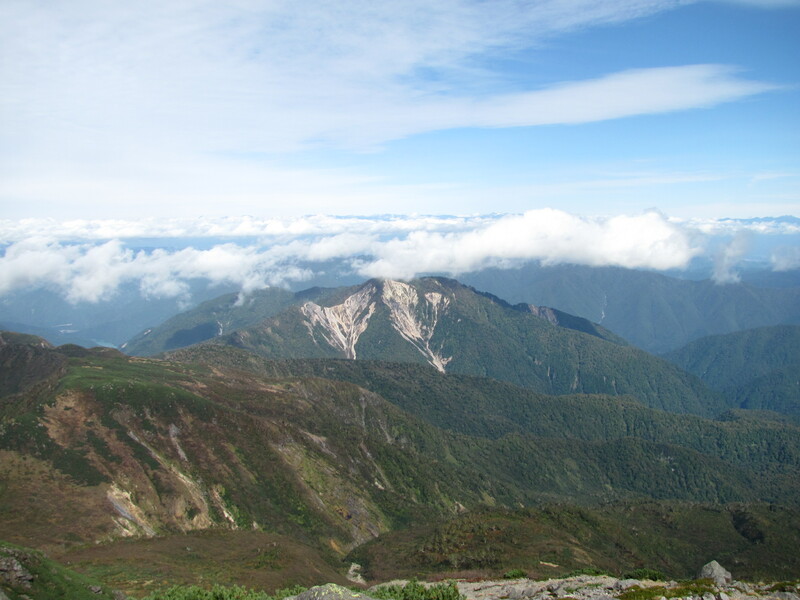 Will I be back on Hakusan for a third go this summer? Probably. But this time, I’m going to reserve a bed, pack a full meal or two, and bring a flashlight. Maybe I’m a glutton for punishment, but something about Hakusan just keeps bringing me back there: every time I go, I find something else I’ve left undone. That is, now that I’ve been to the top, I want to explore the lakes. Until then, sleeping mountain. I know you’re waiting for me. 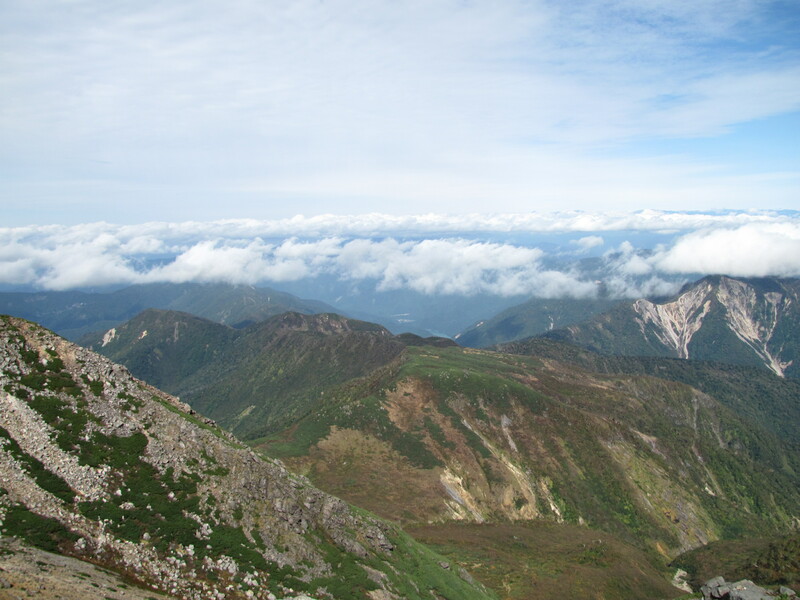 My hikes in Japan are one of the most cherished memories I have. 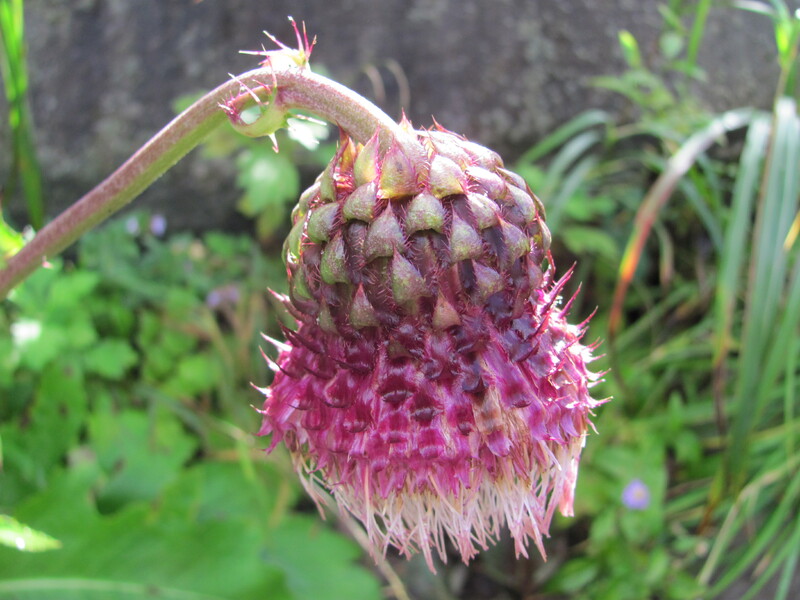 Used to Italian Alps, going up Japanese mountains and finding myself in front of a shrine, or a typical Japanese roof, always entailed a sudden sense of loss of understanding of time and place. It lasted a split second, but I was always incredibly happy to then realize where I was. Probably this doesn’t make sense. I guess. Your story by the way is one of those that make you wonder about the perfection of certain coincidences, let’s call them that. Your friend that drives by exactly when you descended is indeed quite miraculous. Hiking here is great! 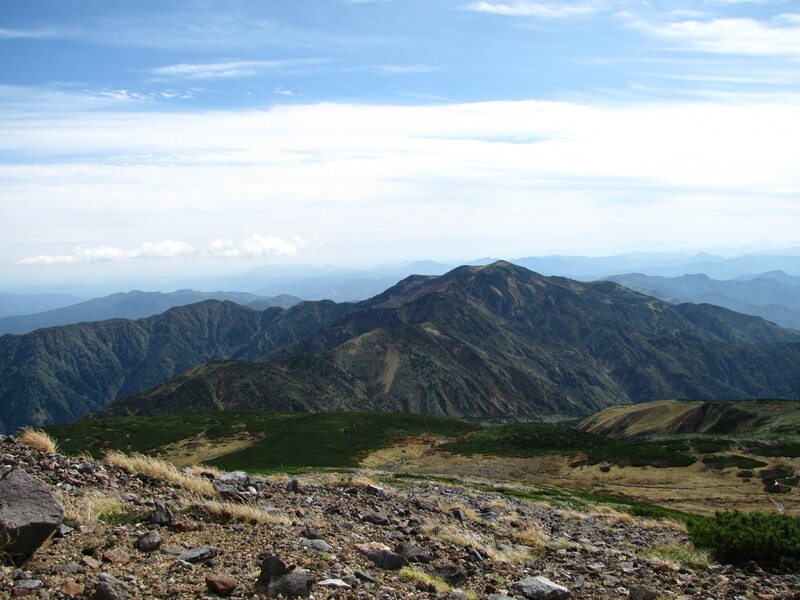 In the Rockies, I was always much more in the forest, but on Tateyama and Hakusan, it’s more ridgeline/mountaintop hiking. Your experience totally makes sense, and I do love the shrines on the mountains. I like to think about the first priest or monk who hiked there, how the shrine was built, and how the mountain was revered. 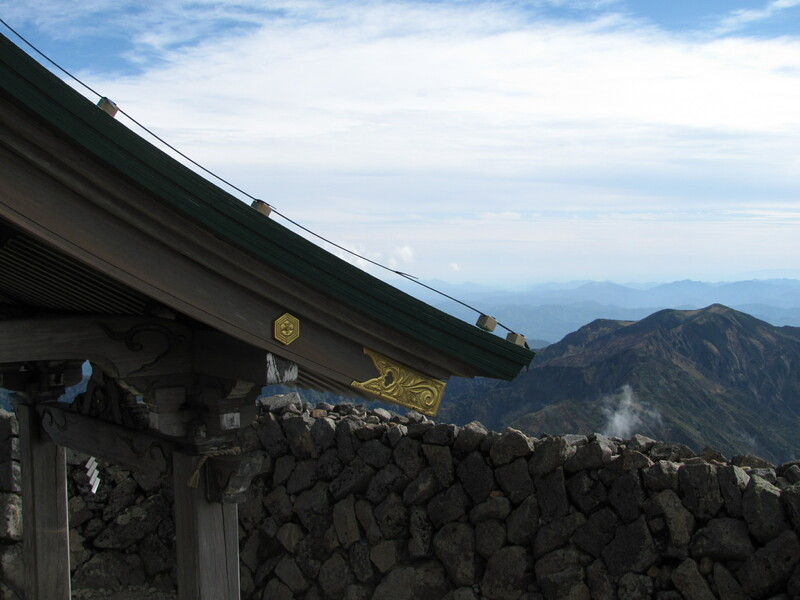 Hakusan is one of Japan’s three sacred mountains, and it protects Ishikawa from typhoons. Her timing was amazing. One of our friends had asked a Japanese hiker if he could give her a lift to the lot in a bit when she showed up in her car after getting hassled by a cop. She speaks the best Japanese of any of us, though, so maybe the mountain gods took pity on us?